Millions of people everyday rely on fire extinguishers to put out minor fires which start in the home. Fire extinguishers contain a powder which is known to instantly put out a fire and prevent it from spreading any further. In 2004, fire extinguishers saved over 25 lives in the United States and prevented over 1,500 injuries. Fire departments all over the world encourage home owners to have at least one fire extinguisher in the home at all times. That said, studies show that approximately 80% of homeowners do have at least one in their home, but the question is do they know how to use it? Sure it's great to know there's a fire extinguisher close by if you ever need one, but what most people don't understand is if you don't know how to use these devices, they are practically useless. Everyone should know how to use a fire extinguisher and if you are one of the many who don't, the follow steps will provide you with everything you need to know. P - The first letter to remember is "P". This indicates to the user to pull the pin. Pulling the pin is the first step in the process and is crucial to the successful execution of fire extinguishers. A - The "A" stands for Aim. 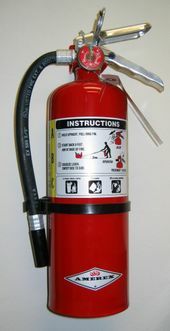 This tells the user to aim the fire extinguisher nozzle towards the base of the flames. S - The first "S" stands for Squeeze. This advises the user to squeeze the trigger while maintaining the extinguisher in an upright position. S - The last "S" stands for Sweep. The user will then sweep the extinguisher from side to side making sure to cover the area of the fire completely. Remembering the word PASS can save the life of you or someone you love. Having a fire extinguisher in your home is a great idea however the location of your extinguisher is a determining factor in whether or not it will be useful. You will want to keep your fire extinguisher in areas which are most likely to produce fires such as kitchens, near fireplaces, garages or areas with a number of candles (perhaps a bedroom). Do not keep your fire extinguisher near your stove. Stoves are a prime target for fires and should a fire break out near your stove, you will want to be able to access your extinguisher. You may also want to keep your extinguisher near an exit so you can leave it the fire becomes too large. Jim Staller has worked in the industrial field for more than 15 years. In his spare time, he serves as a contributing writer for http://www.industrial101.com - a site offering information about data aquisition (http://www.industrial101.com/services/data-acquisition.aspx), cleanrooms (http://www.industrial101.com/equipment/cleanrooms.aspx), frequency converters (http://www.industrial101.com/electronics/frequency-converters.aspx) and more.